A notoriously low-tech cooking method is improved with a dash of WiFi. The Timberline series does its job well and actually puts its app and WiFi connectivity to great use. The technology here is more than just a gimmick. However, the $1,700+ price means it’s for amateur pitmasters rather than casual backyard cookouts. Be the first to review the Timberline 850? The Timberline Series is far from Traeger's first foray into grills or smokers. The company already had a lineup of wood pellet grills, but the Timberlines introduced a few new features -- most notably connectivity. If you're not familiar, wood pellet grills are pretty self-explanatory: they're grills that burn tiny wood pellets rather than charcoal or gas. A box on the side typically holds them, and an auger pulls the pellets down into the grill's heating element. Companies like Traeger call these "grills" rather than "smokers" because they can be used for both. Typically they're capable of cooking at both low (around 165 degrees) and high (over 375) temperatures, making them well suited for all-around use. Just stay close to an electric outlet, because you have to plug them in. With the Timberline series, though, the maximum temperature is 500 degrees -- which means it can be used for pizzas, high-heat searing and other things that demand a super-hot grill. 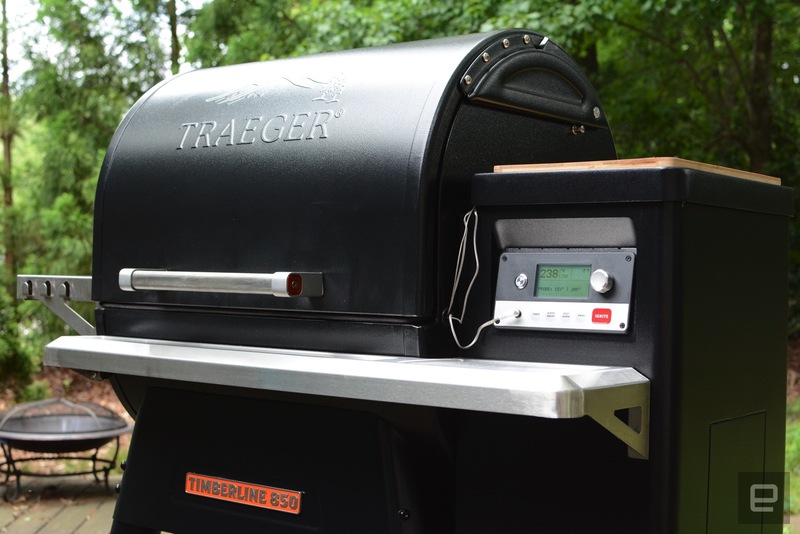 On the Timberline series, Traeger introduced a feature it calls WiFire. It's the company's term for WiFi connectivity, and it allows you to monitor the grill remotely and send recipe-specific settings via a companion app. I know it sounds a lot like just the latest gimmicky culinary tool to sync with your phone, but there's a lot more to it than that. 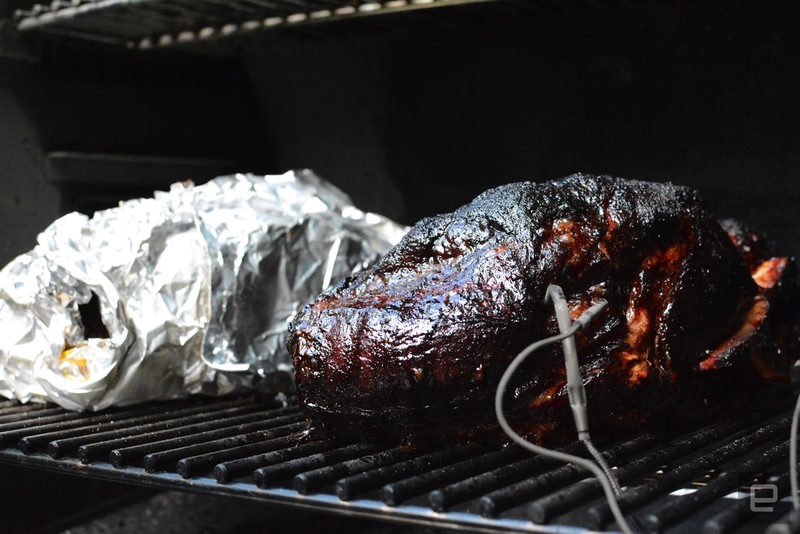 A process that takes as much time as most barbecue does greatly benefits from your being able to monitor it from a distance. At the very least, it means you're not running back and forth to keep tabs on things for six-plus hours. The Timberline series' WiFi connection allows you to do just that. Because some cooks need more space than others, there are two sizes to choose from: the Timberline 1300 and the Timberline 850, each with three racks to accommodate food. Those numbers indicate the amount of cooking space in square inches. I never maxed it out, but Traeger says the smaller of the two can hold nine chickens, eight racks of ribs or six pork butts at once. Or, if you're not trying to feed a small army or meal-prep for a month, you can cook both meats and side dishes at the same time. There's also a cutting board on top of the pellet box so you can do any prep or final cuts right on the grill. The setup process is similar to that of any other "smart" appliance. Once you download the app and scroll through the grill's built-in menu to connect it to your WiFi network, you're good to go. The whole process takes less than five minutes. The only time I had an issue getting the grill and the mobile app to sync up was after a two-week period in which I hadn't fired it up. A quick call to customer service fixed the issue in about 15 minutes. For someone who loves to cook, Traeger's app is a treasure trove of recipes. It's like Pinterest for grilling. Recipes are divided up by protein, with additional categories for veggies, pizza, baked goods, wild game and cocktails. There's also a section for top-rated and a favorites feed where you can quickly access the items you've been eyeing. Of course, you can bypass all of that and manually search if that's more your style. Once you find what you're looking for, there's a handy Cook Now button at the bottom of each recipe. With a tap, you can send the cook time and temperature details to the Timberline without getting up off the sofa. The app is well organized and easy to navigate. And, perhaps most important, there's no delay between making adjustments on your phone and the changes hitting the grill. A seemingly endless supply of recipes is nice, but it's in the remote control that the Traeger app and the Timberline really shine. In addition to remote starts, you can receive real-time temperature info from the grill and adjust the temp as needed without having to run outside. Like other Traeger grills, the Timberline features a built-in meat probe, and that info is also beamed to the app, where the final temp and current temp are displayed side by side. The mobile software also features a timer, a sauce timer and controls for the Super Smoke and Keep Warm settings. Super Smoke, a mode for more intense smoke, is available only at 225 degrees and under, though, so you have to be strategic about how you use it. There's also room to save custom cook cycles in the app, and of course you can shut down the grill remotely. The Traeger app is also where you can download and apply updates to the Timberline should the need arise. During my time with the grill, the company pushed an update to add manual meat-probe calibration. Based on feedback from users (including myself), Traeger added the ability to adjust the meat probe if you felt it wasn't accurate. In my case, I noticed about a 12-degree difference between the built-in probe and the Weber iGrill Mini Bluetooth meat probe during my first few cooks. Once I applied the update, though -- which took about five minutes -- I didn't have any issues. 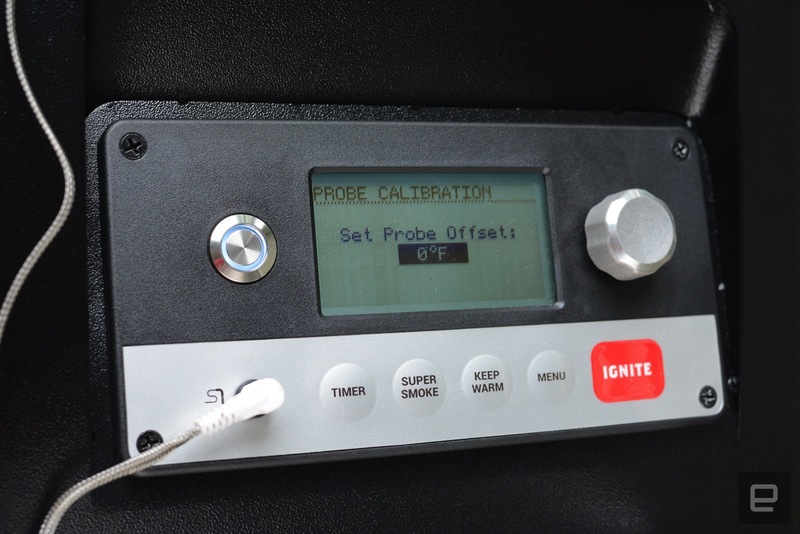 I was able to easily adjust the probe with the on-grill controls to compensate for the difference. Yes, it was an easy fix, but when you purchase a $1,700 grill, you kind of expect it to work perfectly out of the box. Still, it's nice to see that Traeger took notice of a problem and acted to address customer complaints. Aside from the meat-probe calibration, I didn't encounter any other issues with the Timberline 850. I used it primarily as a smoker for chicken, pork shoulders and ribs, but I did crank up the temperature a few times to make sure it worked. Five hundred degrees is the max setting, but during those tests, the thermometer went as high as 505. That's not really an issue; just pointing out that the Timberline is well equipped to hit 500 when you need a quick sear. I made some rookie mistakes on the chicken, but the multiple racks of ribs and pork shoulders I cooked during testing came out delicious. There's a perfect amount of smoke flavor, and the meat was still moist and delicious. At $1,700, the smaller Timberline is a serious investment, and the larger $2,000 option even more so. 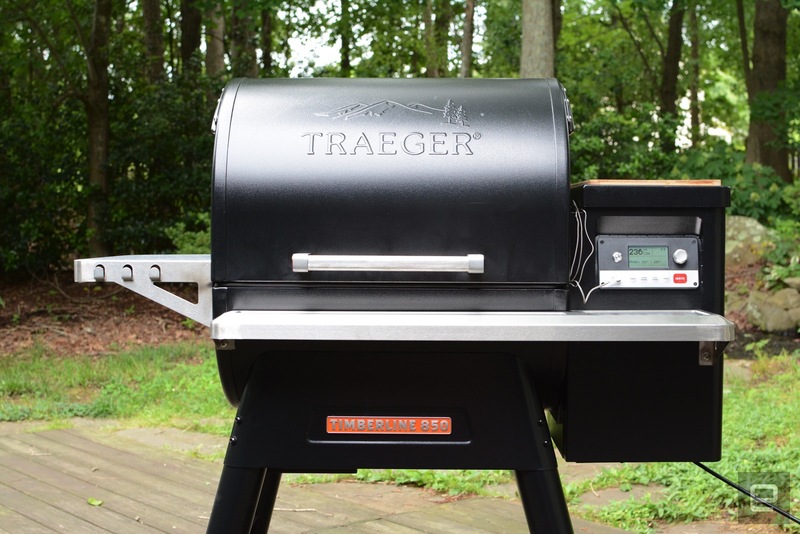 Traeger does offer more affordable options in a range of sizes and feature, starting at $450, but the Timberline 850 and Timberline 1300 are the only two that offer WiFi connectivity and all the extra tools it offers. You also have to consider that you'll need to purchase bags of pellets, along with other supplies like gloves, aluminum foil and grill cleaner. As you might expect, Traeger recommends you use only its pellets, which come in a variety of options for $19 each (20-pound bag) -- wood options like Hickory, Mesquite, Pecan, Oak, Apple and more. That's usually more expensive than the same amount of charcoal, but it does save you from chopping or acquiring split wood if you want to go the all-wood route. During my test, one bag was enough to get me through about two cooks, but depending on temperature and cook time, your mileage may vary. Other companies -- like Pit Boss, Camp Chef and Green Mountain -- make wood pellet grills, but their prices are comparable to Traeger's smaller, non-WiFi-equipped models. Green Mountain also has WiFi, app-controlled models that range from $400 to $1,000, but the largest option offers less cooking surface than the Timberline 850. When you look at other top-level grills and smokers, Traeger isn't asking too much for what it offers. I can certainly understand if you'd prefer to spend your money on a really nice gas grill or a Big Green Egg instead. If you're looking to try your hand at low-and-slow methods, and like the convenience of wood pellets, Traeger has some of the best available options -- even if you don't bite on a high-end model. You could also opt for a charcoal- or wood-burning model from another company and save some money, adding on a $50 iGrill for remote monitoring on your phone. But in my experience, those $300-and-under smokers you find at Walmart aren't well insulated and have trouble maintaining heat. You definitely get what you pay for. I have had some success using my $99 Weber charcoal kettle grill as a smoker, though, so a low-cost but still capable barbecue setup can be assembled on a budget. Traeger's first venture into a connected grilling experience is a compelling one, even if it is too pricey for most backyard cooks. The Timberline works well as both a grill and a smoker, maintaining temperature and cooking efficiently. The company's WiFire technology makes cooking a breeze, especially with long barbecue sessions where you really don't want to venture outside every few minutes. Traeger created an attractive package for aspiring pitmasters who also happen to be early adopters.